Basically, this is the social enterprise stuff I’ve been hinting at recently, or not so recently. I was busy over the summer doing the workshops at NGY and also getting stuff off the ground with Community Organisers and Roots Up. I’ve been trying to secure a premises in town to get the pilot project started for my own ‘thang’. Things are coming along but nothing secured as yet. I’m getting business advice and, possible (hopeful!) funding from The Hive at Nottingham Trent; I did a Pecha Kucha presentation at Broadway at the start of July and a nice dude called Sean, from the Hive clocked my project and wanted to speak to me! I didn’t know this at the time as he didn’t get a chance to speak to me at the event, it was actually Dawn who put me in touch with him through some other avenue, anyway, we got there eventually and I’ve got another meeting. I’m also doing my best to get hold of the lady who is in charge of the ‘Community Regeneration strategy and planning’ (gob-full!) at Metropolitan (where I do my job-job) as I think ‘make to make’ could really fit in with their regeneration plans, not managed to pin her down yet…I will! …a living and a difference. 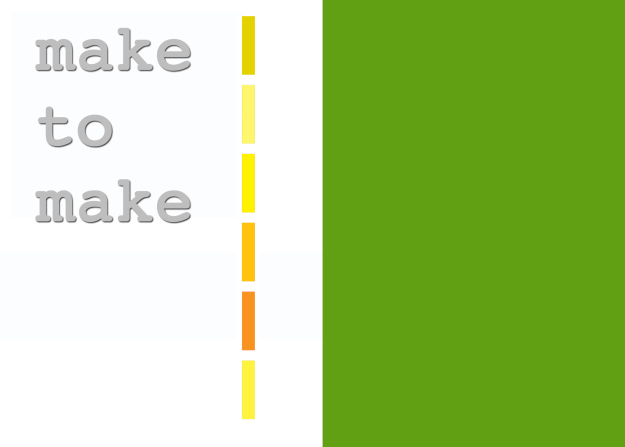 ‘make to make’ is a charity which hopes to achieve three main goals.. Create positive experiences through the medium of creative workshops designed for enjoyment and the chance for individuals to learn new skills. Do some good! `improve peoples skills, increase self confidence, facilitate ethical business practice, make creativity more accessible and promote learning and collaboration. Local creative practitioners are able to develop and deliver workshops to groups about their specialism, sharing their professional knowledge. Anyone can access and book onto the workshops. Some people will pay some will be able to access them for free depending on their situation. Workshops are for the public but we also focus on third sector groups, charities and organisations who have hard to reach service user groups who could benefit from what we provide. The idea is to bring something different to those who wouldn’t usually be able to access, or would not know where to find, more alternative learning options; youth groups, women’s refuges, minority groups or refugees, the elderly and the isolated, ex-offenders and those with substance misuse issues. Basically, anyone seen as ‘vulnerable’ or at risk. The produce that they make together will be sold in the shop and online via the website. The profits go back in to the charity to develop more workshops, buy more equipment and resources etc. The workshop participant gets to learn new skills with professional guidance, builds confidence and self-esteem and gets the opportunity to meet new people. The creative practitioner is giving something back by sharing their expertise. They are increasing their profile and creating opportunities to make a fair living. The produce made will be whatever the practitioner decides to teach within that group and they will ensure these products are to a professional standard. I am currently developing a six week pilot project to happen in the run up to Christmas. Six local practitioners will deliver their workshops to the groups and to individuals who want to get involved and make to make! The workshops will be free for everyone within this pilot. Once all the produce is made, we’ll sell it! We’ll host a market or a shop event and have a big launch party in the city centre. Other creative practitioners will be able to have selling space based on a percentage donation, which also goes back into the ‘make to make’. I aim to be able to extend the pilot workshops and see them happening on a continuous cycle. Workshops on a daily basis being accessed by various groups; Workshops that change every six weeks to keep them fresh and fun and give as many creative practitioners a chance to get involved while giving the customers a more varied set of skills learnt and more excuses for people to keep coming back for more! I need some space! !…in town, easy access with two or three floors so workshops can happen upstairs while the downstairs is the shop and exhibition space, possibly with a café area. I have ideas for longer term, on-going projects and even some international project ideas working with fair trade and sharing skills abroad. ‘make to make’ needs to be mainly self-sustaining, the idea is for it to be independent, to make money, to not rely on grants or funds at least not once its up and running properly. I want to show people that by working collectively you can create independence and achieve not only personal goals but also build something, which can support others in the future, made by and for the people who need it most. If you live in Nottingham, or don’t live in Nottingham but you think you could help either way, please get in touch. Thank you!